The 2019 Fit is full of endless possibilities. It can take all kinds of people and all kinds of cargo all kinds of places, thanks to brilliant engineering and a little magic. Small on the outside, roomy on the inside and fierce under the hood. It’s got space for practically everyone and anything, thanks to four different interior configurations with its 2nd-row Magic Seat®. 29 city / 36 highway / 31 combined MPG rating for LX, Sport and EX 6MT models. 33 city / 40 highway / 36 combined MPG rating for LX CVT model. 31 city / 36 highway / 33 combined MPG rating for Sport CVT, EX CVT and EX-L models. Based on 2018 EPA mileage ratings. Use for comparison purposes only. Your mileage will vary depending on how you drive and maintain your vehicle, driving conditions and other factors. MSRP excluding tax, license, registration, $895 destination charge and options. Dealers set their own prices. 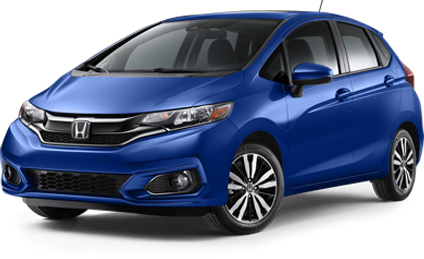 Honda Sensing® includes: Collision Mitigation Braking, Forward Collision Warning, Lane Departure Warning, Road DepartureMitigation, Lane Keeping Assist and Adaptive Cruise Control.